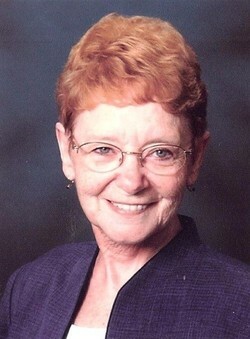 Jacqueline Rose (Jackie) Parmentier, 80, of Moline, passed away Monday, February 11, 2019 at her residence, surrounded by her loving family. Visitation will be Friday, February 15, 2019, from 11 a.m. – 1 p.m. at DeRoo Funeral Home, Moline, followed by funeral services at 1 p.m. at the funeral home. Burial will be at Rock Island National Cemetery. In lieu of flowers, memorials may be made to The Quad Cities Animal Welfare Center. Jackie was born February 13, 1938 in Moline, IL, the daughter of William Stark & Alberta Ryser. She married Emil C. Parmentier on December 17, 1955 in Rock Island. He preceded her in death on May 9, 2009. She attended Moline High School and after Jackie worked as a bartender at Parkside Tavern, she was employed as a Sales Clerk at the Lighthouse. Jackie was a proud military wife who followed her husband to many locations stateside and around the world. She was a 35 year cancer survivor, a die-hard Cubs Fan Club Member, and an avid dog lover. Jackie never told a lie in her life. She is survived by her children Dana (Parmentier) Letterly, Moline, Robert Parmentier, Blue Grass, IA and Tracy Parmentier, Moline; sister, Eugenia Giebel, Geneseo, IL; brother, Richard Ryser, Delphos, KS; grandchildren, Sandy, Christy, Jonathan, Jennifer, Kayleigh, Kaitlynn and several great-grandchildren and 1 great-great-grandchild; life-long friends, Marietta Gilson and Kay Schnoebelen. She was preceded in death by her husband, Emil, son, Larry Parmentier, parents, William and Alberta Stark, step-father, Ernest Ryser, sisters, Barbara Cassady and Willa Mulmstron.